Fresh from hit musical Newsies, Director Robbie Guevarra said, " The title is the same, the music, but with new direction, set, lighting and choreography." With book by Tony Award nominee Mike Ockrent and with lyrics by Tony Award winner Lynn Ahrens, A Christmas Carol is based on Charles Dicken's novel originally published in 1843. It tells the story and journey of a wealthy old man, Ebenezer Scrooge whose life is full of bitterness and losses. Encountered and haunted by the ghosts of his past, present and future, Scrooge transformed into kindler and gentler man after he realized and uncovered the miracle within, the spirit of Christmas and the unconditional love of family and community. 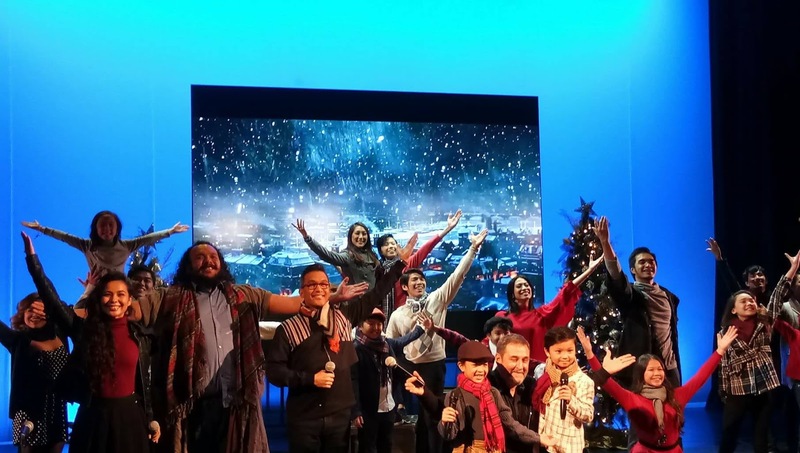 The spirit of Christmas will surely soar and heighten with the music of the legendary and iconic American musical theater and film score composer and pianist of Beauty and the Beast, A Little Mermaid, Aladdin, Pocahontas, Enchanted and Tangled. Menken earned eight Academy Awards, seven Golden Globe Awards, eleven Grammy Awards, one Tony Award, one Drama Desk and two Outer Critics Awards for his works. This restaging production will feature old and new thespians who will give meaningful and magical moment of the most celebrated and most anticipated time of the year in the Philippines as early as September. Reprising and returning as Ebenezer Scrooge is Miguel Faustmann making it his third production with 9 Works Theatrical. Past, present and future production of Repertory Philippines, Faustmann is a veteran and resident manager that never fails to impress. Aliw Award Best Actor winner, writer and blogger Franco Laurel as Ghost of Christmas Past is having a theater comeback after long hiatus. The role was originally offered to him last year but had to decline due to schedule conflict. 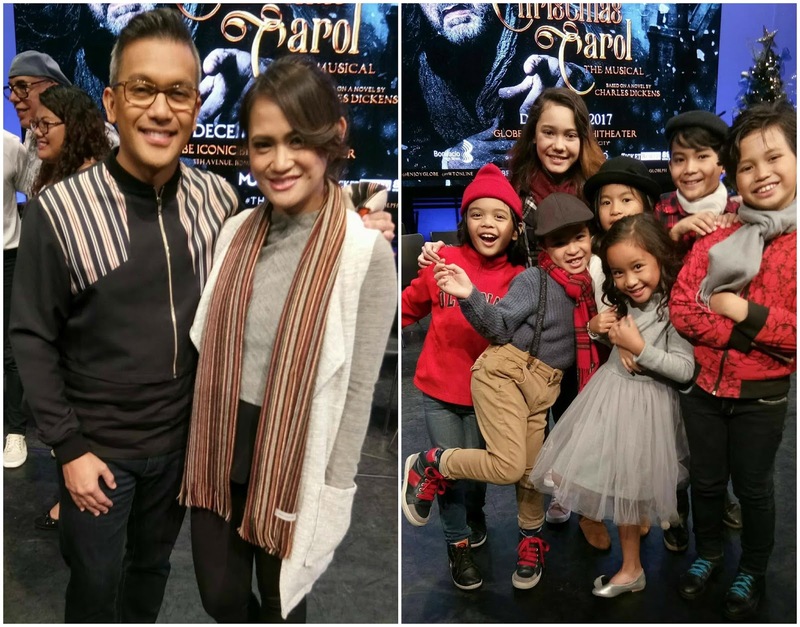 This production mark as his first appearance onstage with his daughter Mariella who's also part of the cast. A Gawad Buhay Awardee, theater veteran, seasoned performer and crowd favorite Noel Rayos joins the cast as the juggling Jacob Marley and Mr. Fezziwig. Nico Dans as Ghost of Christmas Present and Rissey Reyes as Ghost of Christmas Future. Introducing in this production are Jaime Yupangco and Elai Estrella as Tiny Tim. 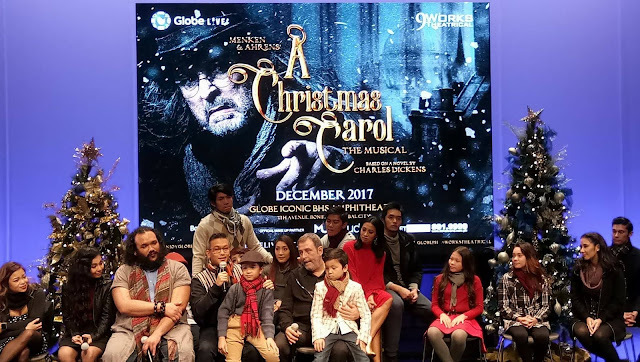 Jon Abella and Tricia Canilao as Mr. and Mrs. Cratchit, Dawn Eduave as Mrs. Fezziwig, Laurence Mossman as Young Ebenezer, Arman Ferrer as Fred, Mitzie Lao as Emily, Gian Gloria as Sally, Krystal Brimmer and Rayne Cortez as Grace Smythe, Tory Cortez as Jonathon, Omar Uddin and Diego Soler as Scrooge at 12, Simone Martinez and Cerise Ramirez as Fan, Joe Ng and Bourne Luna as Fred's son, Kyle Francisco as Martha Cratchit, MC dela Cruz as Mr. Smythe, JP Basco as Young Marley, Josh Ramirez as John William Scrooge, Kendrick Ibasco as Beadle, Vyen Villanueva as Mr. Hawkins, Jourdan Bartolome as Old Joe, Mariella Laurel as Scrooge's mother, Peachy Atilano-Guevarra as Mrs. Mops, Shalee Vicencio as Mrs. Hawkins and Joni Galeste. Franco Laurel with Daugther Mariella, and the other Children cast. Twitter and Instagram: @9WTonline and @enjoyGlobe YouTube: GlobePH.